Over the past several decades, the field of nanotechnology has perceived an uplifting graph of achievements and developments. Among the principal nanoparticles contributing for the same, ZnO nanoparticles should be considered as the foremost. By having unique –OH groups on the surface; ZnO presents numerous tunable properties when functionalizing it with several decorating moieties. Regarding the current status of ZnO nanoparticles in biomedical applications; drug delivery, gene delivery, bio imaging, bio sensing etc., should be remarked initially. However, the applications of ZnO nanoparticles are getting dragged backward because of the residing toxicity in them. Among the recognized toxic mechanisms of ZnO nanoparticles in living system so far, reactive oxygen species (ROS) generation has been marked firstly. Fig. 1. Possible mechanisms of action of melatonin-ZnO nanoparticle in C6 glial cells. Attempts have been put forward to reduce the toxicity of ZnO nanoparticles by iron doping, polymer coating, antioxidants etc. Among the known antioxidant hormones secreted in human body, melatonin is considered as the major one; which could act against certain ROS inducing agents like lipopolysaccharides. The present study focuses on the evaluation of protective influence of melatonin on ZnO induced cytotoxicity in C6 glial cells. 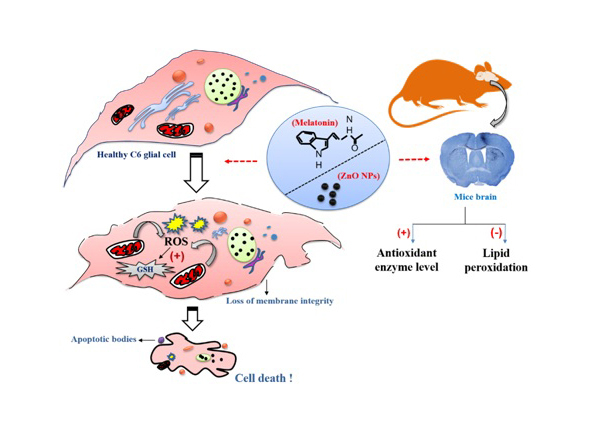 In order to elucidate the particular; cytotoxicity, mitochondrial membrane potential and free radical formation upon particle exposure were analyzed. Furthermore, consequences with the antioxidant enzymes generation were also checked in brain slices of mice. To analyze whether there is any modulation in ZnO induced cytotoxicity, cells were pre-treated with melatonin. Results indicated an elevated cytotoxicity in cells exposed to a combination of melatonin and ZnO; unlike either of the particle alone. Contrary to facts from available literatures, antioxidant property of melatonin was kept suppressed against oxidative stress induced by ZnO; though there was an anti-proliferative action in C6 glial cells. Study correlates the elevated cytotoxicity during melatonin pre-treatment prior to ZnO with the mentioned mechanisms. Also study confirms the cytotoxic action of melatonin is primarily due to oxidative stress imparted by alterations with mitochondrial electron transport chain while mitochondrial membrane potential remained unaltered. However, melatonin induced the production of anti-oxidant enzymes in brain slices of mice; suggesting a protective role in normal tissues. An overall representation of possible mode of action of melatonin-ZnO nanoparticle combination is depicted in Figure 1. Altogether, study evidently proved the improved cytotoxic action of melatonin-ZnO nanoparticle combination in C6 glial cells; suggesting the possibility of applications for cancer treatment in future. Zinc oxide nanoparticles mediated cytotoxicity, mitochondrial membrane potential and level of antioxidants in presence of melatonin.